Welcome to a little house update friends! 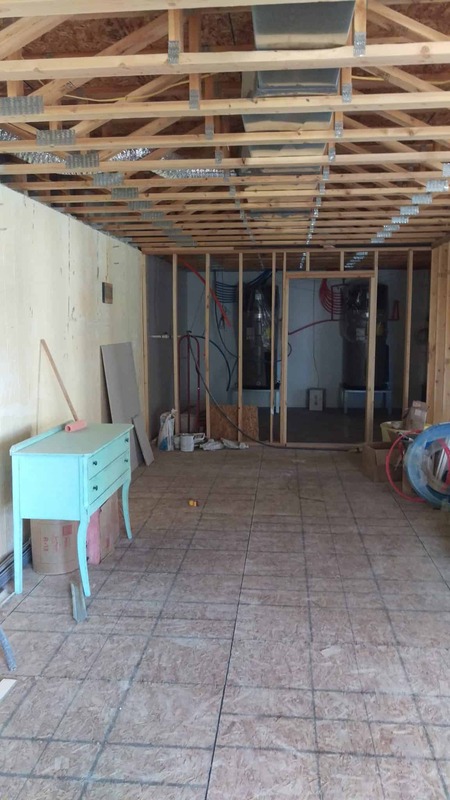 I’ve had lots of people ask about the house lately so I thought I’d do a quick post on where we are at the moment. The pictures are just off my phone, nothing fancy, but this will give you a peak into the project. 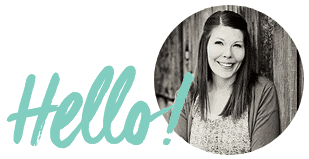 If you are new to the blog, here’s what’s going on. My husband and I are nearly 21 months into your DIY house build. 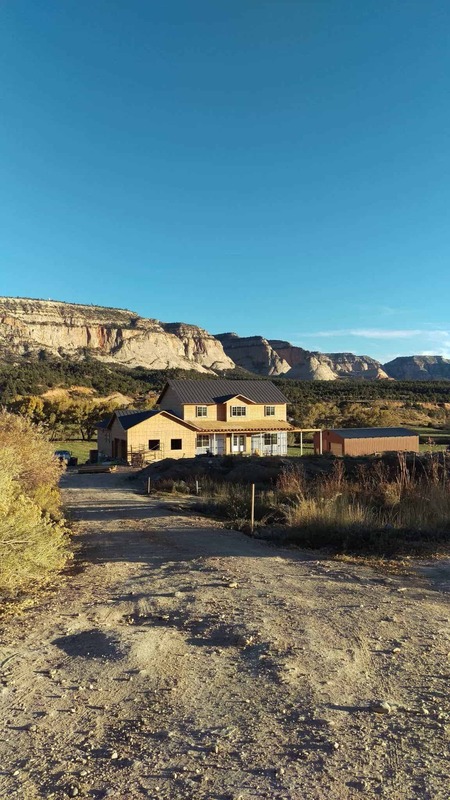 We bought our dream property (7 acres overlooking our favorite mountains) in 2014 and started planning our dream house then. We told my mom (who went to college for drafting) all the things that we did and didn’t want in a house and she hand-drew us plans in 2015. My husband (an engineer) took those plans, digitized them, and tweaked them over and over again into our version of perfection. We started building our own house in January of 2016! It’s been a LONG road and mama is tired, but now that we are getting so close to moving into our forever home, it’s getting so exciting. Building your own house isn’t for everyone (heck, I don’t think it’s for me) but my husband has loved this journey and it’s going to be beautiful under his careful eye. You can catch up on all of my house building updates here. So currently we have all the painting done (yay! 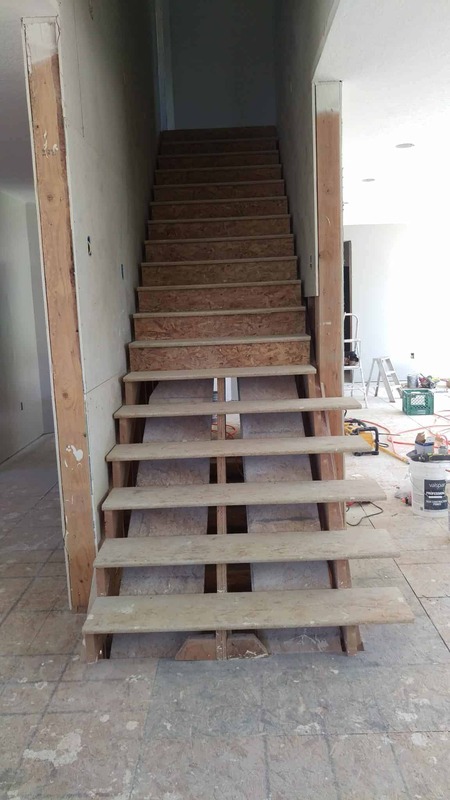 ), except for the walls that we are going to put ship-lap on (the living room and both sides of our stairwell). We did get help on painting. I’m losing steam, and if we want to be in by Christmas, help is a must. 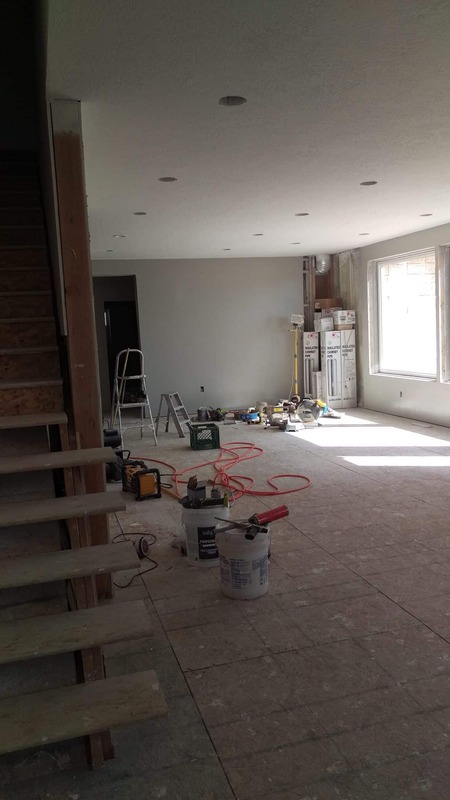 I had the upstairs primed so they finished priming, painted the ceiling, and did a few of the main colors, then I came back in and painted smaller rooms and closets the colors that I wanted. I LOVE all of the colors I picked and wish the pictures did them justice. Kitchen cabinets get here MONDAY!!! This is a huge milestone in my mind. I’ve been dreaming of this kitchen (pictured) and the cabinets for years. Seeing them in the house will probably make me tear up. So this is the kitchen. Where the walls aren’t finished yet will be my tile backsplash. You can also see some of the furniture that I’ve been collecting just waiting to get settled into the new house. I got a new hutch (it’s huge!) to display all my pretties and I got all of the kids new beds. It was time! After 12 years of “making-do” I’m looking forward to decorating and getting some things that I like and fit the space well. Look into the living room. We still need to frame the fireplace in the corner. You can see my gray on the walls pretty well here and I just love it. It’s the overall neutral of the house. Stairs still looking rough. Can’t wait for these to get finished! 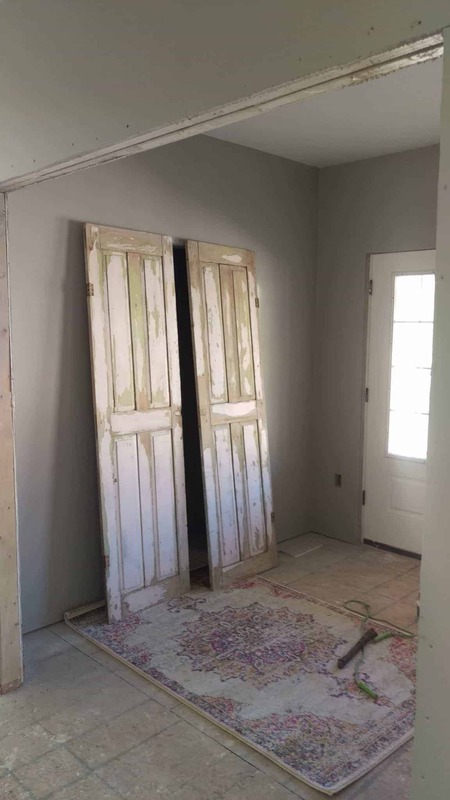 I saved some old doors from The Shanty and I’m using them for closet doors in the entry way! We’ll put them on barn door rollers and I’m really happy with them. The rug in the picture didn’t make the cut, though. 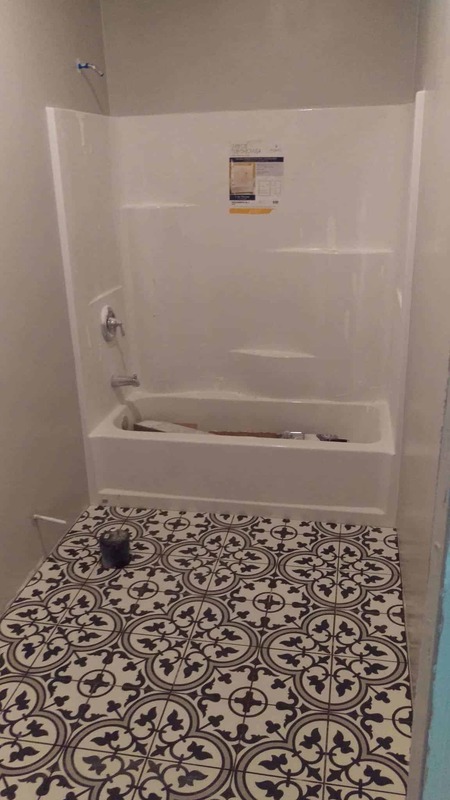 And in the entryway, we now have tile! Not finished or grouted but it’s started. I have an old church pew waiting downstairs to come up to this room. The tile has lots of texture and looks a bit like concrete. 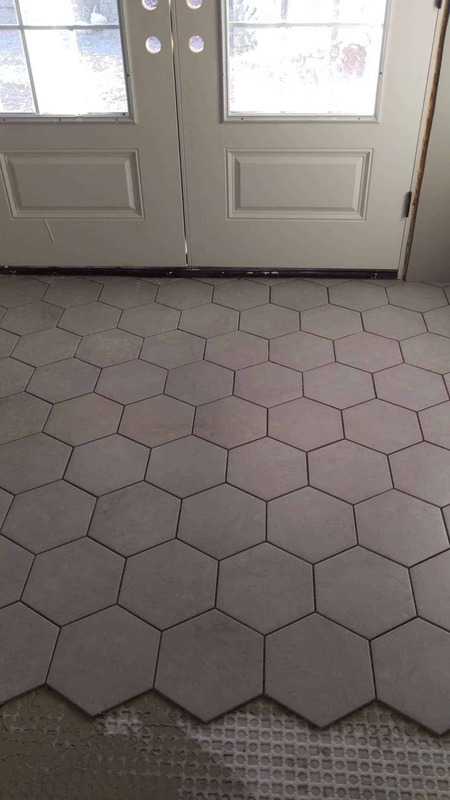 I love the hexagon tile because it makes me think of chicken wire and honeycomb. Still in love with the drinking fountain in the hall just by the back door. 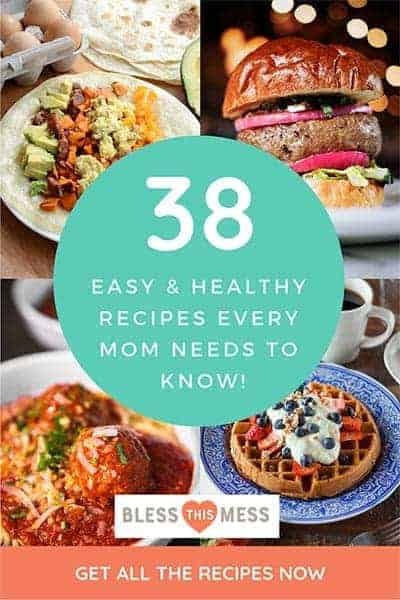 We use it all the time already! I’m in need of a cute old stool to put here for the kids – holler if you have/see one! The hall bathroom also has the start of tile! Isn’t it fun? This is the room I have that cool blue desk thing for a vanity (picture lower). I think it’s going to be a lot of fun. 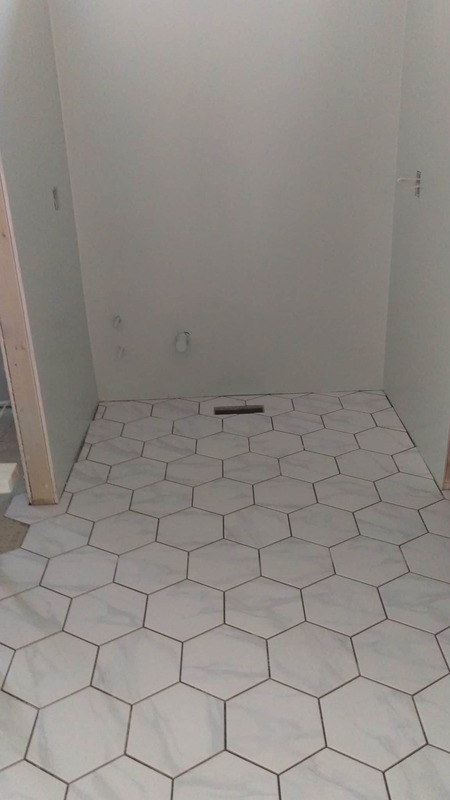 More hex tile for my bathroom too! The color on the walls is such a pretty light blue green. I wish you could see it better. In the laundry room I got a little crazy and hung wall paper! There will be cabinets on both sides of this and my folding table in the middle, so just a little pop of sunshine while folding laundry. I’m really happy with it. It only took 3 hours to hang 3 pieces. HA! It was a lot of fun to do with my friend Karen though. Isn’t it pretty? From the laundry room to the mud room that is also my pantry/bulk storage! 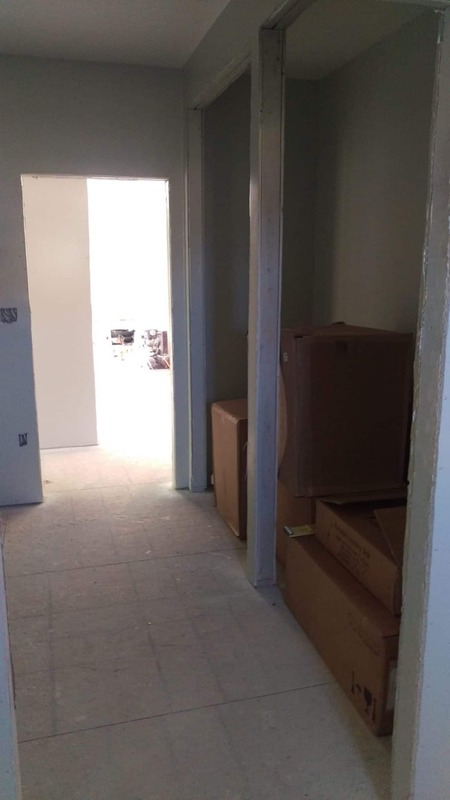 It’s filled up with boxes of towels and sheets that I bought for the house as well as sinks for the laundry room and bathroom, plus bathroom mirrors and lights! So much stuff! Downstairs is still unfinished but it is super clean now. We are turning on the heating system this week so I’ve been working on getting all of the dirt and dust out of the house. You can see the blue desk that will be the upstairs bathroom vanity on the left. And check out those HUGE water heaters! I’ll never run out of hot water again (and they are heat pump driven which means two of them will cost less to run then my current electric water heater!). We got them on a great sale at the last hardware show we went to. Can’t wait to have lots of hot water. Between laundry, dishes, and baths, I run out most evenings. Upstairs is so clean! We have carpet scheduled for the week after Thanksgiving. 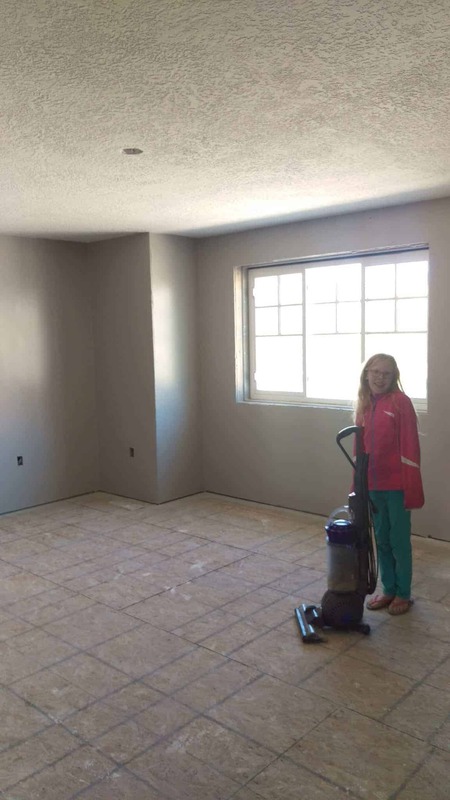 Our goal is to have a whole lot of stuff done by then so that the carpet is kind of the last thing going in. Wish us luck. While I’ve been painting and cleaning inside, Thomas has been working on getting our wrap-around porch and back deck on the house while the weather is so nice. This porch/deck has taken so much time. He started designing it at the end of June, we waited on supplies through August, and then he started working on it in September. It’s 1600 square feet of outdoor living space though and I know it will be worth all of the work. I just can’t wait to see it! Some days, things feel like they are moving right along and other mornings I still cry thinking about just how much more we have left to do. Building is tricky like that, exciting and exhausting all at the same time. I’ll try to keep you updated more now that there are some visible things changing. Thank you for letting us share this crazy adventure with you. It’s so fun to get your feedback and comments, it really does keep us going. The porch is looking great! Just the perfect finish to the outside. It is soooooooo worth it in the end…..the gray walls are beautiful. 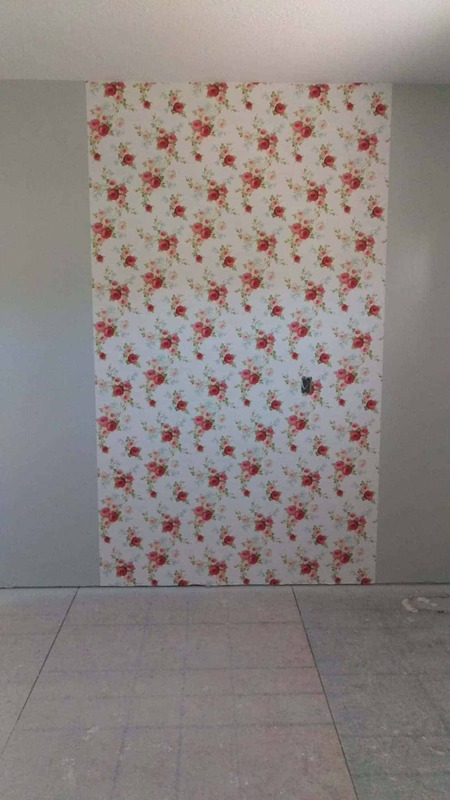 I giggled at your wallpaper….the perfect touch! Everyone should have an enjoyable space to do laundry, it makes it easier to get the nasty chore done! And yes, having kitchen cabinets installed will be a very emotional and exciting day or four! I will be on the look out for a stool….in the meantime, maybe there is some spare shanty wood available. Is there a badge in boy scouts for building a stool? It looks amazing! I love your style and fun personal touches to make it your own. And two hot water heaters is wonderful. We rarely run out of hot water since we have two and am thankful for that luxurious blessing. Ah, how exciting and fun! 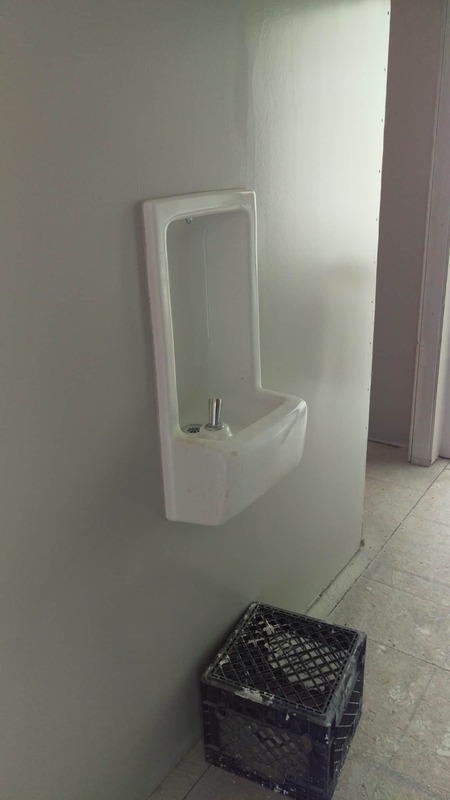 The drinking fountain in the hallway is genius!! Thank you! It’s SO useful already and we don’t love there, lol. 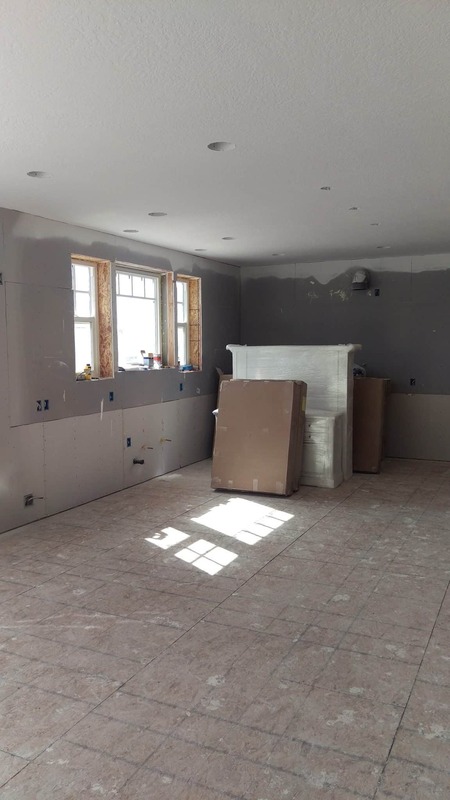 I am always so excited when I see an update on your new home project! It is perfection; thanks for keeping us in the loop! Wowee!! It looks amazing. It will be worth every drop of sweat! Move the rug (that won’t go in the entry) to the laundry room. It goes with the wallpaper nicely.